Berlitz® Italian Premier Language course for beginner, intermediate and advanced levels - Learning that’s Fast, Easy and Effective! 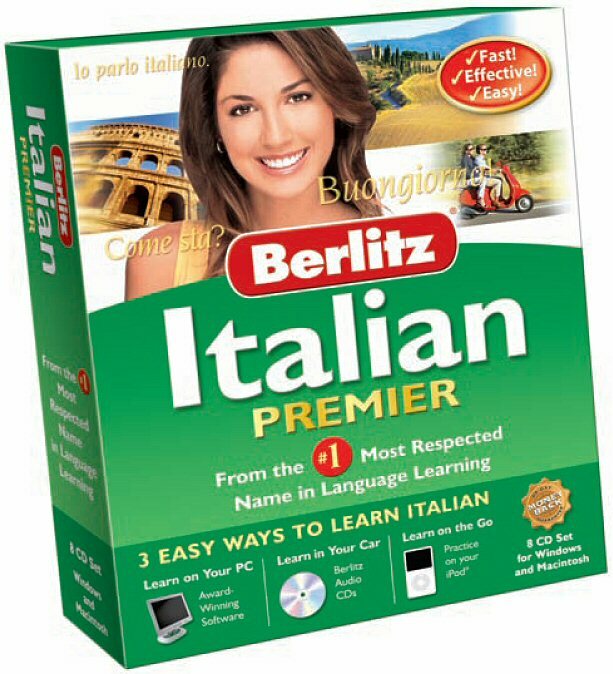 Our Berlitz Premier Italian course is a complete language-learning package all in one box. Although the literature claims this course is aimed at levels up to advanced, this is more up to an "advanced beginner" level. Nonetheless, for beginners and experienced Italian speakers who are looking to brush up their Italian skills quickly ahead of a holiday or business meeting etc, this is a formidable package for the price. At the end of this course, your vocabulary will have grown by over 1000 words and phrases, which is enough to enable you to get by in most everyday situations, and provide a solid foundation for branching out on your own language learning activities. What we also like about this Italian language course is its flexibility - you really can use these learning materials practically anywhere, and the mix of different learning media eg PC and audio CD adds to the interest of using this course. Complete Italian Course all in one box!. Use on your PC, Audio CD Player or MP3-Player! Learn Italian the easy way with the straightforward, effective system that’s been helping people learn foreign languages for more than a decade. Developed by an editorial staff of 30 teachers, Berlitz Italian Premier makes learning, fast, fun and effective – and it’s 100% guaranteed! For more than 125 years the Berlitz® brand has been synonymous with effective foreign language learning. With language centers spanning the globe, Berlitz has more satisfied students than any other program of its kind. And now Berlitz Italian Premier is guaranteed to make learning Italian easier and more fun than you ever imagined. What Sets Berlitz Italian Premier Apart? Ideal for busy people – learn on your PC, in your car or on the go! Minimal formal grammar instruction! Instead, you’ll absorb a grammatical system naturally, by using it in conversation. Interactive flash cards help you to learn essential words and phrases. On you PC/Mac: Benefit from Berlitz'z Total Immersion Learning philosophy. Listen to actual conversations, and enhance your enhance your knowledge by watching videos. Th Flash Card System reinforces your learning with this proven method. The integrated Speech Analysis software helps yoy improve your pronunciation with practice conversations. In your Car: Our Italian Premier package includes a complete Italian course on 4 audio CDs, helping you to improve your fluency while you're on the road. On the Go: Practice your vocabulary using your iPod® or other MP3 player. Test your proficiency with word lists that match the software. Plus... 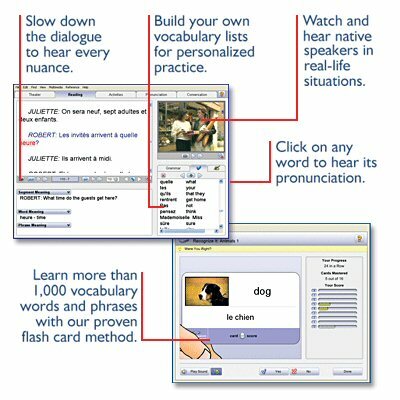 Flash card software for your Palm® or Pocket PC Vocabulary building screensaver And much more!